Who are The Sydney Jazz Professionals? A highly skilled and experienced jazz band comprising the finest Sydney jazz musicians. What make them Sydney’s premiere jazz band? Great sounding music everytime guaranteed! Expertise at creating the perfect atmosphere at any event. A huge selection of jazz, latin, blues and jive. Background dinner music to upbeat dance tunes. Artists including Frank Sinatra, Chet Baker, Louis Armstrong, Antonio Carlos Jobim, Michael Buble, Harry Connick Jnr, Georgie Fame, etc. 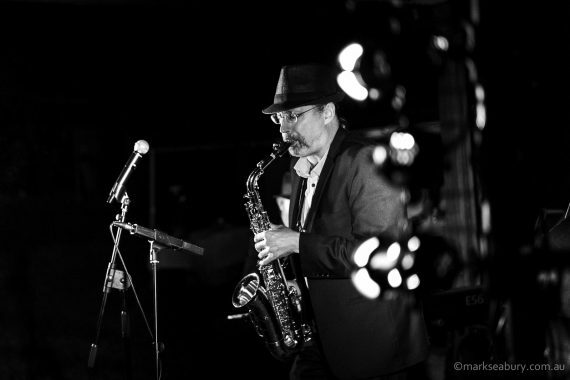 Bandleader Steve Arié both sings and plays saxophone so the band can be instrumental and/or include vocals. The band is available as a duo (vocals/saxophone and guitar or piano) up to a quintet (including double bass, drums and extra horn). Steve Arié is a professional Sydney based multi instrumentalist. After more than 20 years as one of the most in demand double bass players, he has reinvented himself as a quirky vocalist and alto saxophonist with more than a nod to the style of Chet Baker and Paul Desmond. He has performed with countless Australian greats. They include D.I.G., Dale Barlow, Bernie McGann, Ten Part Invention, George Washingmachine, Wanderlust, Pardon Me Boys, Frank Bennett, Martin Plaza and Gyan. He has toured both nationally and internationally. Highlights include two performances at the prestigious Chicago Jazz Festival, The Hothouse Jazz Club Chicago, The Kennedy Centre for Performing Arts (USA), Edinburgh Fringe Festival (Scotland), Ruhrfestspiele (Germany), Queenstown Jazz Festival (New Zealand) and music festivals throughout Australia.